This near-future trilogy is the first chance for English-speaking readers to experience this multiple-award-winning phenomenon from Cixin Liu, China's most beloved science fiction author. In The Dark Forest, Earth is reeling from the revelation of a coming alien invasion-in just four centuries' time. The aliens' human collaborators may have been defeated, but the presence of the sophons, the subatomic particles that allow Trisolaris instant access to all human information, means that Earth's defense plans are totally exposed to the enemy. Only the human mind remains a secret. This is the motivation for the Wallfacer Project, a daring plan that grants four men enormous resources to design secret strategies, hidden through deceit and misdirection from Earth and Trisolaris alike. Three of the Wallfacers are influential statesmen and scientists, but the fourth is a total unknown. Luo Ji, an unambitious Chinese astronomer and sociologist, is baffled by his new status. All he knows is that he's the one Wallfacer that Trisolaris wants dead. I loved everything about this book; the sheer epic scale of the pending alien invasion, humanities space race to fortify Earth's outer defenses, the sophons that limit technological advancement, and the unique characters. 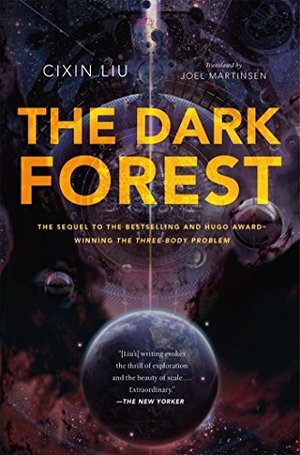 The Dark Forest evolved from The Three Body Problem by encompassing a more space operatic feel. The future Earth featured heavily as the plot spun hundreds of years which provided an interesting look at what could become. As for the impending doom threatened throughout the book, there was a taste of the much hyped Doomsday Battle, albeit brief but brutal to wet the appetite for the third installment. These books just get better and better.